The Canadian Produce Marketing Association (Half Your Plate folks) hired me to work on a recipe and video series and I’m delighted to share it here with you. And for times when you have extra broccoli and are wondering what the heck to do with it, here’s my Broccoli 4 Ways video. Dietitian's Tip: Broccoli stalks are full of vitamin C so don't toss them. Trim the ends, peel (or chop/slice thin) and use them just as you would use the florets. *Kids Cook Teach your child how to make the dressing, then put them in charge of making more dressing when you run out. Start by making the dressing in a large bowl (and save a bowl to wash!). Whisk together ¼ cup canola oil, 2 tbsp red or white wine vinegar, 1 tbsp honey, 1 tsp Dijon mustard and ¼ tsp EACH salt and pepper. 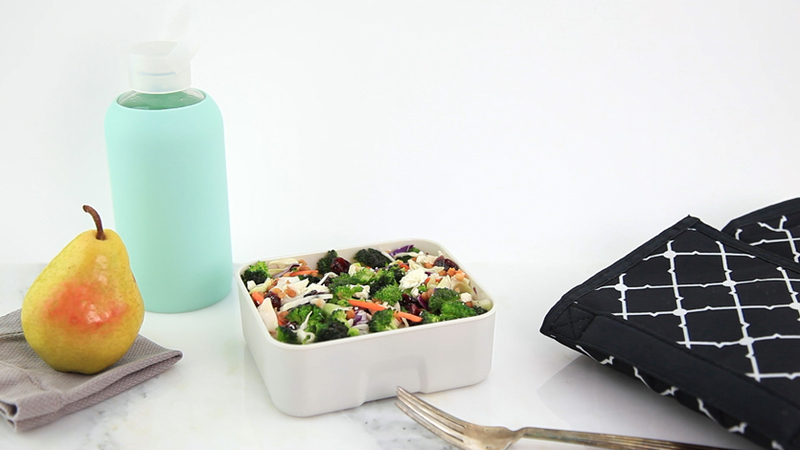 Add 2 cups of chopped broccoli florets, 1 bag of coleslaw mixture, 1 can lentils (rinsed), and ½ cup dried cranberries or raisins. Toss to coat in dressing. Crumble in ½ cup feta cheese. • Bolster the protein to make this a meal by adding chopped hard-cooked eggs, canned tuna, leftover dinner meats, beans, chickpeas, tofu or more lentils. • Add a diced apple for extra colour, crunch and sweetness. • Add a few slices of crumbled cooked bacon. Yes it's a processed meat but you don't need a lot of bacon to add a lot of flavour!